REUTERS/Robert GalbraithiAd was launched by Steve Jobs in 2010 but remains just a ‘tiny part’ of Apple’s business. 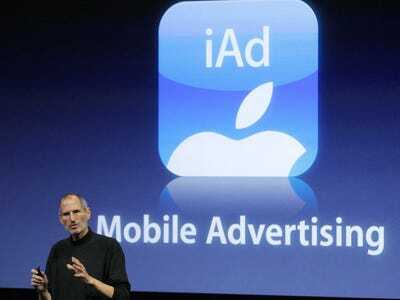 Apple’s mobile advertising unit iAd is moving into programmatic advertising for the first time by partnering with Rubicon Project, an automated advertising company. The move signals that Apple is finally looking to shake up its tiny ad business, four years after its launch, and turn it into a true competitor of the likes of Google and Facebook in the mobile advertising space. A press release published by Rubicon Project on Tuesday, which has been removed (but still accessible via a cache on Google), says the partnership means advertising across Apple’s vast array of mobile apps will now be accessible to brands via Rubicon’s direct order automation platform, forming a global open marketplace for the buying and selling of iAd inventory. Until now, advertisers looking to reach Apple’s 600 million iTunes users via mobile had to purchase ads directly and upfront via iAd’s sales team. Programmatic — also known as automated — buying speeds up the process because advertisers can book ads via an online platform, removing the back-and-forth negotiations between salespeople, and it can also offer the ability to bid on ad placements in apps and websites in “real time” through auctions. The move suggests Apple is becoming more open to sharing its data with other providers than ever before. Most advertising platforms with vast amounts of first-party proprietary data are extremely protective of it — it’s the best kind of data because it is validated through user registrations (rather than just being assumed, as per other advertising platforms that have to guess characteristics of a user based on their browsing and purchasing habits), which leads to more precise ad targeting and can be sold at higher rates. But the growth of iAd has been largely stunted to date as advertisers became increasingly perturbed that Apple refused to give them much access to the wealth of data it has about its users. Rubicon Project describes itself as a leader in advertising automation, having built up its business by creating a stack of technologies allowing marketers and publishers to buy and sell advertising in real-time auctions, known as RTB. However, it is now also trying to build out its direct advertising offer: The partnership with iAd follows its acquisitions of iSocket and Shiny Ads earlier this week, businesses that specialize in “programmatic guaranteed,” which is sold on an upfront basis. Rubicon reported a 60% jump in revenue year-over-year to $US32.2 million in the quarter to the end of September. Both Apple and Rubicon Project did not immediately respond to requests for comment. At iAd’s launch in 2010, Steve Jobs, then Apple’s chief executive, set out the ambitious goal that iAd would capture 50% of the mobile ad market. 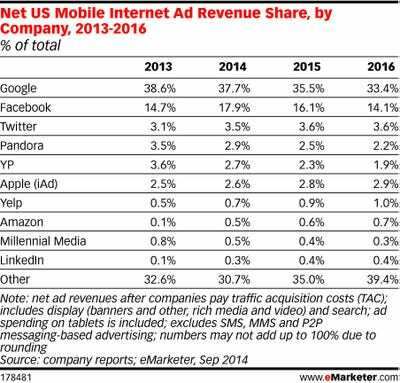 However, it’s still some way behind that lofty target, with just a 2.6% share of the US mobile ad market, according to eMarketer. Apple will be hoping the partnership with Rubicon Project will go some way to boosting its mobile ad market share. 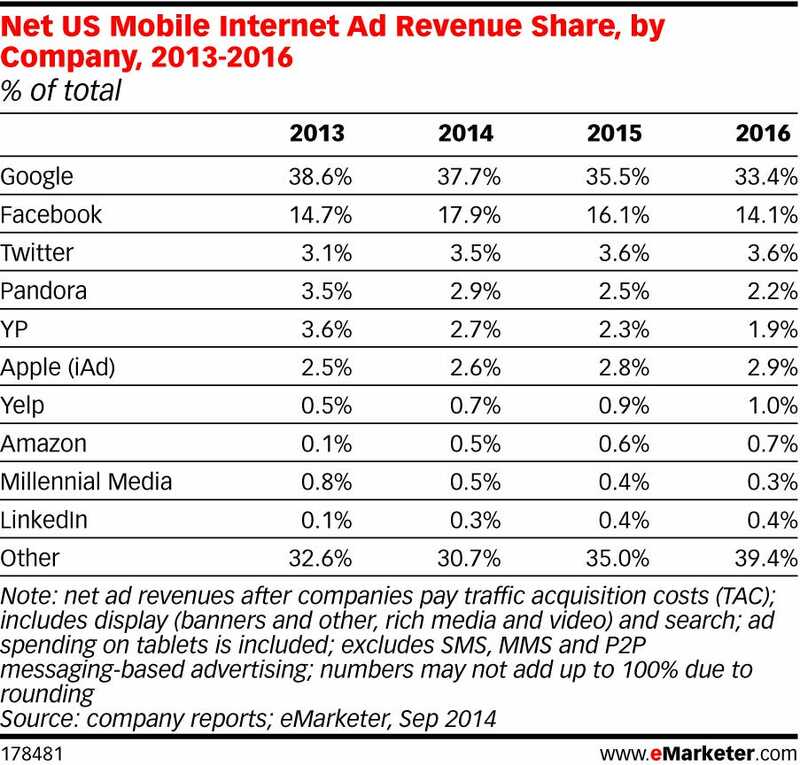 It is one of several recent moves the company has made to ramp up its mobile ad business. In October Apple announced iAd was undergoing a huge international expansion, bringing the number of countries it operates in to 95. In June, Apple announced new premium ad formats, providing advertisers with video and full-screen banner ads across iPod Touch, iPhone, and iPad. Apple’s CEO Tim Cook acknowledged in September that iAd was merely a “small part” of its huge business. Indeed, the most recent data from IDC indicated Apple generated just $US125 million in mobile ad sales in 2012 — a tiny fraction of the $US157 billion in net sales the company reported that year.